A Morton’s neuroma usually develops between the third and fourth toes. Less commonly, it develops between the second and third toes. Other locations are rare. It also is rare for a Morton’s neuroma to develop in both feet at the same time. The condition is much more common in women than men, probably as a result of wearing high-heeled, narrow-toed shoes. This style of shoe tends to shift the bones of the feet into an abnormal position, which increases the risk that a neuroma will form. Being overweight also increases the risk of a Morton’s neuroma. Precisely What Can Result In Tendon Pain In The Achilles ? Achilles tendonitis is an overuse injury. Too much too soon is the common cause of overuse injuries, however other factors can contribute to developing the condition. An increase in activity, either distance, speed or a sudden change to running up hills. As a rule of thumb distance runners should increase their mileage by no more than 10% per week. A change of footwear or training surface for example suddenly running on soft sand can cause the heel to drop lower than normal making the tendon stretch further than it is used to. Weak calf muscles can tighten or go into partial spasm which again increases the strain on the achilles tendon by shortening the muscle. Running up hills – the achilles tendon has to stretch more than normal on every stride. This is fine for a while but will mean the tendon will fatigue sooner than normal. Overpronation or feet which roll in when running can place an increased strain on the achilles tendon. As the foot rolls in (flattens) the lower leg also rotates inwards which places twisting stresses on the tendon. Wearing high heels constantly shortens the tendon and calf muscles. When exercising in flat running shoes, the tendon is stretched beyond its normal range which places an abnormal strain on the tendon. 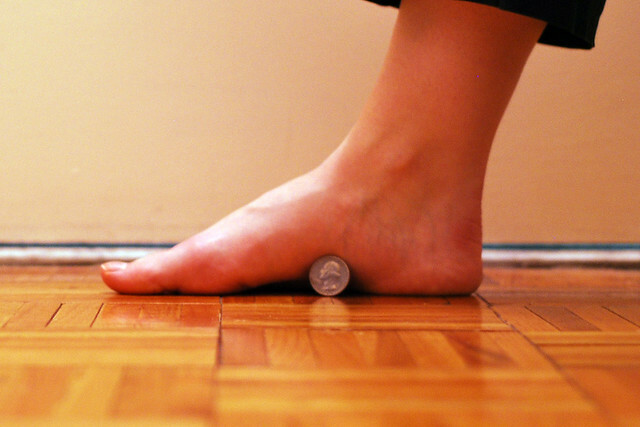 Achilles tendinitis can typically be treated at home by following the R.I.C.E. treatment method. Rest. Rest the tendon by avoiding activities that irritate the tendon or increase swelling. However, this does not mean you should be completely inactive for long periods of time, as this can cause stiffness in your joints. It?s still important to stretch in order to maintain strength and flexibility and partake in activities that don?t put direct pressure on the tendon, such as bicycling. Ice. Apply ice to the affected area for 20-minutes at a time, every couple hours, as needed, to reduce swelling and pain. Compression. Use compression bandages to help reduce swelling. Elevation. Elevate your ankle above the level of your heart to help reduce swelling. It is particularly important to do this at night while you sleep. Simply place a pillow or two under your ankle to keep it elevated. Once the tendon has healed, be sure to gradually return to more strenuous activities. If flattened arches contributed to the injury, wear shoes with appropriate support or inserts to prevent the condition from progressing or recurring. If these non-surgical treatments have not been able to provide relief of symptoms after several months, surgery may be performed to remove inflamed tissue. However, this is not usually recommended unless all other options have been exhausted. Consult your doctor for more information about surgical treatment options. Toe pain can be caused by medical conditions that involve the toe either directly or indirectly. For instance, a bunion is a condition that affects the big toe joint, whereas tarsal tunnel syndrome involves the tarsal tunnel that is located near the ankle bone. Pain in the toes is a symptom that is common for both these conditions. Apart from carpal tunnel syndrome, ingrown toenail, and bunion, toe pain at night could be a symptom of gout, peripheral neuropathy, hallux rigidus and Morton’s neuroma. The underlying causes may vary from one person to another. These are just some of the tips for you to get rid of your unpleasantly looking hammer toes. After following them, in no time, you can already have the perfectly shaped toes that you have been wanting for so long. Most of the time, you’re going to find that you may have to consult with a Doctor to get it surgically removed. If this is the case, you may find that you will want to talk with your insurance company to ensure that they will cover it. By doing so, you will find that there are many alternatives. A hammertoe caused by inappropriate footwear can be corrected by wearing properly fitting shoes. If a high arch caused the condition, wearing toe pads or insoles in your shoes can help. 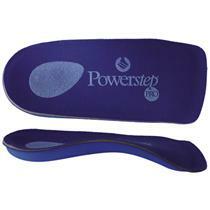 These pads work by shifting your toe’s position, which relieves pain and corrects the appearance of your toe. You can usually use over-the-counter cushions, pads, or medications to treat bunions and corns. However, if they are painful or if they have caused your toes to become deformed, your doctor may opt to surgically remove them. 17.Get a regular massage. Massage can really help with delayed muscle soreness and fatigue from the abnormal stress from high heeled shoes. What wasn’t so simple, though, was making up for the money Duffy’s had lost. It was only closed for three weeks after the tornado, but the tourists who normally thronged into Utica on summer days on their way to Starved Rock were taking other routes. They’d heard about the disaster and, according to what Lisle Elsbury was picking up here and there, they figured Utica was still in disarray. That exasperated him, but what could he do? Some afternoons Bimm would drive out to the site of her new house and just stand in the yard, taking it all in, while the wind fingered its way through the trees. The earlier a hammertoe is diagnosed, the better the prognosis and treatment options. Your doctor will be able to diagnose your hammertoe with a simple examination of the foot and your footwear. He or she may take an x-ray to check the severity of the condition. You may also be asked about your symptoms, your normal daily activities, and your medical and family history. It is possible that simply changing footwear is the remedy, however, if your case is more severe and you have pain when you walk, the fix may require surgery. Talk to your doctor to see what the right course of action is for you. My feet have always been labor intensive. When I first learned to walk, our family doctor advised my mother that my high arches were a problem. This led to many years of tears over black patent leather Mary Janes and later penny loafers. Instead of these pretty and popular shoes, my feet were forced into leather lace up shoes with design features appealing only to women over 90 who were legally blind to boot. Thus, shoes were a source of shame and humiliation long before my feet ever started bothering me. People with high, stiff arches are probably more susceptible to bony injuries on the outside of their foot, ankle, and leg, while people with flat and flexible arches are more likely to get soft tissue injuries and problems on the inside of their lower body. While low-arched runners seem to get a better bargain, don’t forget that Achilles injuries , muscle strains, or other soft tissue problems can be just as disruptive as a stress fracture or stress reaction Hope this makes sense but does anybody have any ideas? Going to a foot doctor isnt an option right now. College funds wont permit it for a few months. Feet come in all shapes and sizes. Long or short, chubby or skinny, pointy or flat. When it comes to runners, the arch is one of the key parts about the feet to be aware of. Both high and low arches can be problematic for runners, but high arches pose a special risk of causing problems elsewhere in the body. Of course, your foot is just one part of t he complex ballet of motions that is running. For a truly complete analysis of your gait , contact our friends at the iRun store in Miami. Treatment for the high arch foot depends on what is going on. With muscle weakness or balance issues a person really needs to see a podiatrist. If it is generalized foot pain they seek relief for a soft orthotic or change in shoes can be helpful. If calluses are present it is usually due to too much pressure in the area. Lotion, callus trimming and a good arch support are worth a try. What to expect at Dr’s Office If you are seeking a business opportunity in Singapore that will give you attractive profit margins, happy customers and high job satisfaction, call us now to find out more. Women’s Shoes – Wearing high heels with a narrow toe box causes deformities like corns and hammer toes, knee pain, bunions, and lower back pain. An ideal women’s shoe is one that has a square, wide toe box with a heel that is lower than two inches. If you must wear higher heels, choose a shoe with a platform under the toe box to decrease the overall stress on the foot pad. Midsole – The material that sits between the top area of the shoe and the outer sole is the midsole. Soft material should be used for the midsole to provide shock absorption. High arch shoes are those with a significant cushioning and flexibility. Shoes for under pronators need to have a soft mid sole, which can absorb shock. High arch support shoes should have at least a medial or arch side support. For runners who are under pronators, the high arch shoes are necessary to rectify the pronation and help them run fast and efficiently and with minimum injuries. A very important thing while choosing high arch running shoes required to be flexible is that the forefeet of people having arched feet are rigid. The shoe’s flexibility makes up for the rigidness of the foot. People, who are on their feet for extended periods of time , such as teachers or nurses , are at higher risks for Plantar Fasciitis because of the hard surface s that they stand on all day. Exercises like strenuous dancing or running over long distances may put unnecessary stress on the heel s of the feet Injury risk increases when these exercises are performed without proper stretching before and after. Vamp – This section covers the top of the foot and may be closed with snaps, laces, or fabric. The vamp should be snug to hold the foot firmly in place but loose enough to avoid pain and numbness. The symptoms of this type of foot can vary and are hard to predict. Depending on what type of shoe gear someone wears will also predict their symptoms. Symptoms can include pain in the metatarsal region, constant ankle sprains with weak ankles, Achilles tendonitis, difficulty with shoe fitting, stress fracture, and knee pain, just to name a few. Formation on of hammertoes is a common side effect of a long lasting cavus foot type. If subluxation or dislocation of the joint has occurred at the ball of the foot then additional repair of what’s called the plantar plate is required as additional repair to the toe. As a runner, you need to make sure your feet are taken care of. Any damage to your feet should be avoided at all costs. It’s really only a matter of wearing the right model of running shoes and taking the time to determine your foot type is a small price to pay. Your feet are well worth the investment. Never engage in cardio activity unless you are pain-free. Cycling is great because it eliminates heel impact, and promotes a calf and arch stretch. Be patient. PF is by nature a stubborn condition that must run its course. It may take up to one year to resolve. The symptoms of a high arch foot will vary depending on how severe the condition is and the activity levels of the person with it. Most will have no pain or any other symptoms. Symptoms may vary from a mild problem with shoe fitting to significant disability An accurate diagnosis is important because the underlying cause of cavus foot largely determines its future course. If the high arch is due to a neurologic disorder or other medical condition, it is likely to progressively worsen. On the other hand, cases of cavus foot that do not result from neurologic disorders usually do not change in appearance. Physical therapy may also be prescribed to stretch and strengthen the muscles of the lower leg. Tight calf muscles and weak muscles along the outside of the lower leg (peroneal muscles) are often present in pes cavus. While therapy cannot change the shape of the foot, it may be able to help with pain control and function. Because the foot is usually rolled inward along with the high arch, the individual is susceptible to chronic ankle sprains and some reactive muscle strengthening may be beneficial, along with ankle bracing. The high arched feet in these paintings demonstrate a similar pattern to the pediagraph imprint of a pes cavus foot. The researchers found increased BMI to be strongly associated with non-specific foot pain in the general population, and with chronic plantar heel pain in a non-athletic population. Inconclusive evidence was found for the association between BMI and hallux valgus, tendonitis, osteoarthritis, and flat foot. Two studies were found that reported a reduction in foot symptoms following weight-loss surgery. A combination of any or all of these elements can also be seen in a ‘combined’ type of pes cavus that may be further categorized as flexible or rigid. 9 Well there it is girls! Accept the challenge and have fun. Follow these guidelines and you’ll be “Dancing with the Stars”. Tight calf muscles can contribute to plantar fasciitis. Keeping these muscles flexible can help relieve and avoid plantar fascia pain. Stand with your hands against a wall, with the leg you are wishing to stretch behind the other leg. The heel of the back leg should remain planted on the ground throughout the entirety of the stretch. Lean slowly forward while bending the front leg. A slight stretch should be felt in the middle of the calf of the back leg. The stretch should be repeated six to eight times and held for 15 to 20 seconds each time. During my yoga teacher training program , we have been learning a lot about anatomy. We are studying not only muscles and bones but we are looking at the whole body and its fascial and myofascial linkages – the dense, tough tissue that surrounds all of your muscles and bones, in effect connecting them in a big web. Basically, we’re not just looking at what muscle do individually but also how muscles influence (and are influenced) by other muscles and structures to which it is connected to through myofascial linkages. While you are waiting for the stretching to take effect, this product can make walking a whole lot more pleasant. Barefoot, stand as tall as you can on your toes. Balance for a moment and then begin walking forward with slow, small steps (take one step every one to two seconds, with each step being about 10 to 12 inches in length). As you do this, maintain a tall, balanced posture. Be sure to dorsiflex the ankle and toes of the free (moving-ahead) leg upward as high as you can with each step, while maintaining your balance on the toes and ball of the support foot. Walk a distance of 20 metres for a total of three sets, with a short break in between sets. It has two air cells joined by a tube, one under the heel, one behind the Achilles. The bottom air cell acts as a pillow when you walk on it, slowly letting the air move to the other cell to cushion the impact. When you swing your leg forward through the air, the pressure from the Achilles pushes the air back, ready for the foot to land again. Recently, the pain began. It started with just a little soreness in his right heal after a long day of work. He didn’t mention it to me right away, but after a couple of weeks, the pain started to really become severe. A night splint holds the foot at 90 degrees during your sleep. The aim of the splints is to keep your foot and calf muscles stretched during the night. Normally during rest the plantar fascia and calves tend to tighten and shorten. So when you wake up in the morning and take your first steps, the fascia are being pulled all of a sudden, causing the sharp pain in the heel. Slowly lean your body towards the wall while keeping in mind that your feet must remain flat on the floor. Hold your position for 20 seconds and straighten up to relax. Repeat this process for ten times. heelspurs.com (this web site) was ranked by visitors as the most beneficial “treatment”, indicating visitors believe information is a key to getting better. Visitors are frequently very thankful for heelspurs.com because it shows them they are not alone or crazy as is often implied by friends, family, co-workers, and doctors. Purchasing plantar fasciitis shoes is not that difficult. However, if you are confused about buying them, you can consult with plantar fasciitis consultants who would conduct exhaustive testing of your feet and recommend the appropriate type of shoes. Choosing and wearing the right pair of shoes will certainly lead to pain relief in the feet. Do not resume training where you left off. Depending on how much time you missed, you may need to start at 25% – 50% of your usual program and increase 10% or so a week from there or as instructed by your physical therapist, doctor or coach. Replace worn shoes and consider a replacement insole in ALL of your shoes for optimal support and cushion. Unlike a typical fracture where bone breaks from a physical force, a stress fracture results from the overuse or overstressing of normal bone which eventually damages the bone itself. This usually occurs with over-exercising or certain anatomic problems which make one susceptible to the problem. You can get plantar fasciitis running shoes that are designed to protect your feet while running. These shoes are built with more durability than normal plantar fasciitis shoes because they have to handle the stress of your running. Running puts a lot of pressure on your heels and can greatly irritate plantar fasciitis. The best plantar fasciitis running shoes will prevent this. For people who need to dress out, dress shoes are important. There are special dress shoes for plantar fasciitis out there that you can look at getting. So you can be assured your feet are being protected even as you look your best. The major benefit of these shoes comes in the form of prevention. Plantar Fasciitis shoes do more than help to fix the Plantar Fasciitis that has already occurred. The shoes work to keep the foot in a position that will keep it from becoming irritated once again. If you suffer from Plantar Fasciitis regularly you should seriously consider Plantar Fasciitis shoes. These shoes will offer the support that you need to keep your feet from being irritated. With less tension on the plantar fascia, the damage to ligament can be reversed. 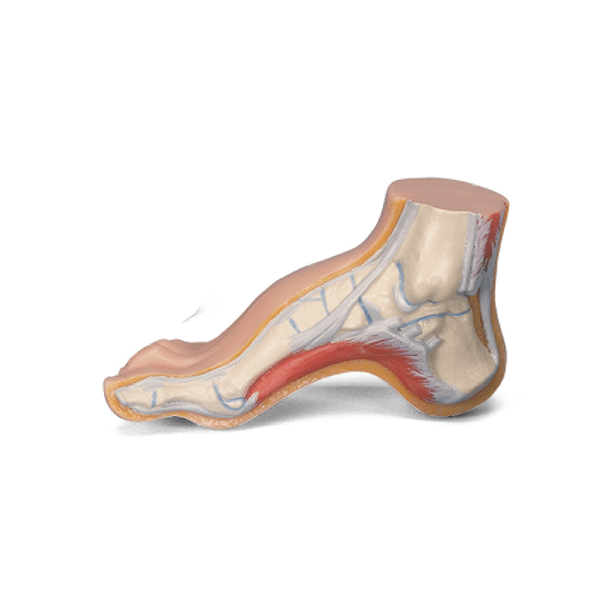 The tissue is allowed to heal faster and repair the micro-tearing, which has occurred at the heel bone attachment.